A simple, country style fireplace screen offers a unique solution for many a problem hearth. 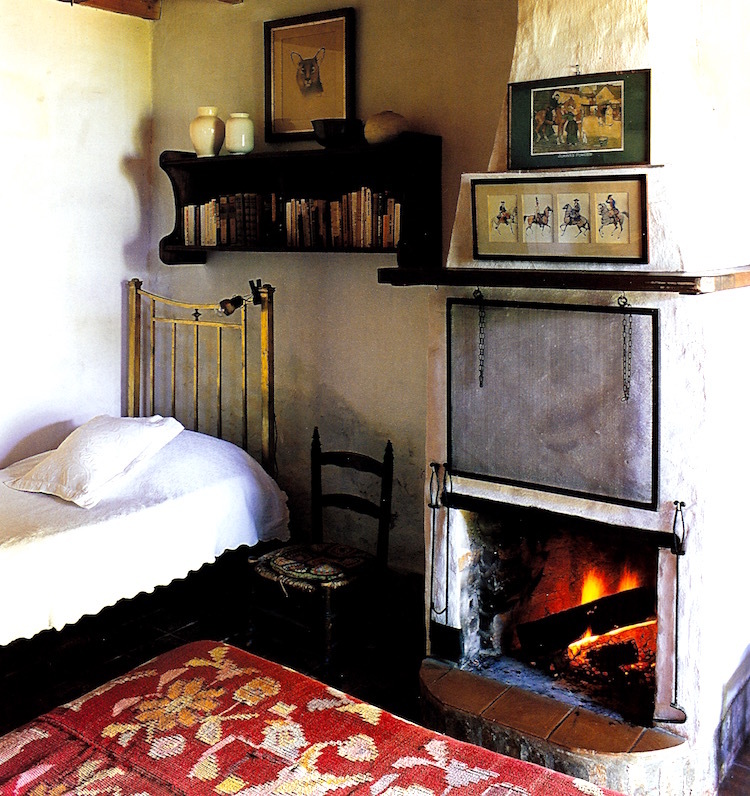 The guest bedroom in an Argentine country home contains a type of fireplace screen I’ve never seen before. To safely cover a shallow old fireplace hearth, the flat wrought iron screen hangs from a pair of hooks installed on the underside of the mantel. A pair of rings, attached to the top of the frame, slip onto the hooks to suspend the screen in place above the firebox. There are also a pair of chains looped through the rings. When the fire is built and the screen is needed for protection, the screen is lifted off the rings. A pair of carefully measured chains are put on the hook so the screen hangs down to cover the firebox at the perfect height. This exceptionally clever fireplace screen works in this room because the mantel shelf is high. But the idea could be applied to many otherwise difficult fireplace situations. Usually, the base of the hearth is wide and deep enough to hold a folding screen, which stands on its own — though it needs to be moved to light the fire. Since this small room also is furnished with an antique hand-woven Argentine rug, that’s not ideal. Another option for a quirky hearth would be use a built in screen with a pair of doors. I have that type in my Cinderella Fireplace. That sits in a metal frame attached to the side walls. But this single hanging fire screen is a much simpler idea and no surprise to see it in a restored home in a country famed for its use of wood fires for cooking — indoors and out.